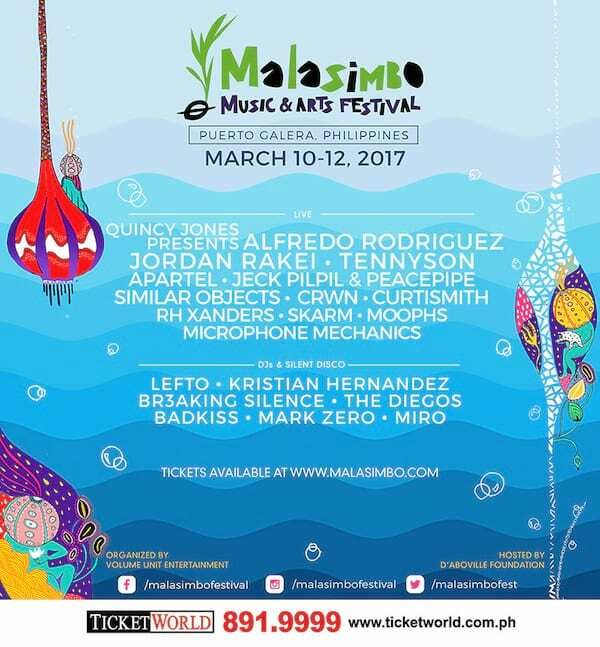 Malasimbo Music & Arts Festival 2017 Live Quincy Jones presents Alfredo Rodriguez, Jordan Rakei, Tennyson, Apartel, Jeck Pilpil & Peacepipe, Similar Objects, CRWN, Curtismith RH Xanders, Skarm, Moophs, Microphone Mechanics. Dj's & Silent Disco- Lefto, Kristian Hernandez, Br3aking Silence, The Diegos, Badkiss, Mark Zero, Miro. For details and tickets visits: TicketWorld and MalasimboFestival.com or call +632-891-9999.